Idaho Power Co. is a 50-percent owner in the North Valmy coal-fired plant in Nevada. COURTESY OF IDAHO POWER CO.
TWIN FALLS — Idaho Power Co. is making some serious strides toward eliminating coal from its energy sources. Despite a growing demand for electricity over time, the company has managed to substantially decrease its reliance on coal as an energy source. Ten years ago, coal-fired electricity made up 38.2 percent of the total energy Idaho Power required for its customers. Last year, coal sources made up only 17.5 percent of its energy portfolio. Meanwhile, the company has replaced that energy source with purchased power and long-term contracts for renewable energy. Natural gas has also grown over time as an energy source. About 46.4 percent of the company’s energy needs are met by its hydroelectric plants. And Adam Richins, Idaho Power’s vice president of customer operations and business development, has previously estimated about 70 percent of the company’s power portfolio is non-C02 emitting. Idaho Power has also made reduction of carbon emissions a priority. Its goal is to ensure the average carbon dioxide emissions intensity of its energy sources is 15 to 20 percent lower than 2005 levels. The North Valmy coal-fired plant, near Interstate 80 in Northern Nevada between Battle Mountain and Winnemucca, uses emissions-control technologies such as fabric filters that remove more than 99 percent of particulate emissions, Idaho Power said in its filing with the Idaho Public Utilities Commission. The company is a 50-percent owner of the plant, which receives its coal via railroad from mines in Utah, Wyoming and Colorado. If the Idaho Public Utilities Commission approves the agreement with NV Energy, Idaho Power would stop using one unit of the North Valmy coal plant by Dec. 31. The company would end its participation in the operations of the other unit by Dec. 31, 2025. As a result of Idaho Power’s filing, the typical residential customer would see a 10-cent increase in his or her average monthly bill beginning June 1. That’s so the company can recover its investments in the Valmy plant. The Idaho Public Utilities Commission will establish a deadline for parties to intervene and then to comment on the case. Residents can learn more about the case by visiting puc.idaho.gov. The increase would be on top of a $19.2 million rate increase Idaho Power has requested, which if approved would increase the average customer’s bill by $3.49 per month. The company also wants to decrease its energy efficiency rider rate, which would drop the average customer’s monthly bill by 83 cents. 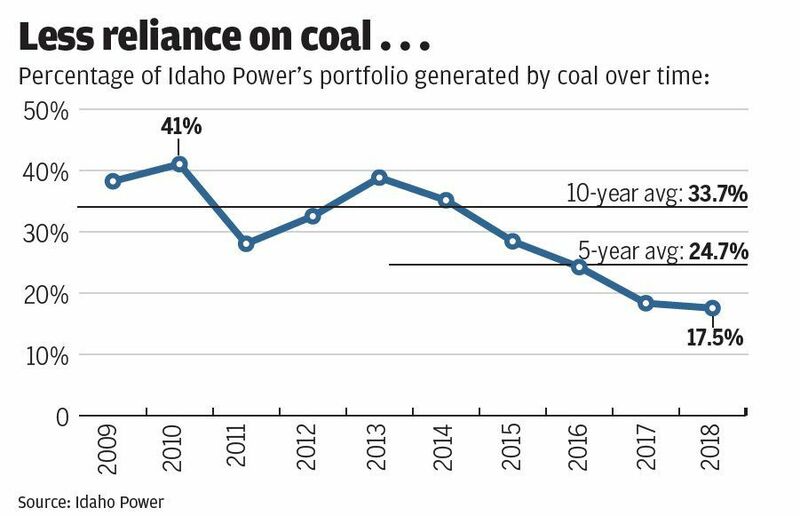 Idaho Power also owns 10 percent of the Boardman plant in Oregon that is scheduled to cease coal-fired operations in 2020. The rest of that plant is owned by Portland General Electric. Idaho Power’s largest coal-fired power source is the Jim Bridger plant in Point of Rocks, Wyo., capable of providing the company with 770,501 kilowatts. Idaho Power owns one-third of that plant, and is exploring options for continued reduction of emissions there. The utility may leave that plant altogether in the future. BOISE — Idaho Power has requested a $19.2 million rate increase, which if approved would increase the average customer’s bill by $3.49 per month. Great! Mankind didn't need to run out of rocks in order to move beyond the stone age.